The NEP Wiki is a public platform to democratize the discourse on New Education Policy Draft issued by the MHRD. It's more transparent, more collaborative, and more productive! It's your platform to rethink education, to make recommendations to the MHRD, to heed several different views, to dialogue, and to participate in policy-making. It's your chance to make your ideas heard! Investors Roundtable on the NEP on 28 July 2016 brought together 28 participants including prominent philanthropists, corporate and business leaders from Mumbai to dialogue on the MHRD NEP draft, and to think together for reforms as critical stakeholders in education in the country. The consultation consolidated diverse perspectives on the existing NEP proposal, along with a plan for collaborative action to put forth key recommendations to the MHRD. 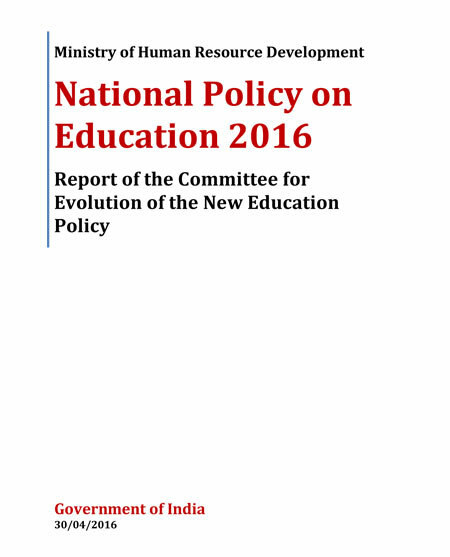 Policy Analyses on MHRD's draft report of the NEP in line with CCS's key values and principles of education reform. Our team continues to work to consolidate its critique through inputs from scholars and experts including Geeta Gandhi Kingdon, Professor, University College London; Ambrish Dongre, Fellow, Centre for Policy Research; Ekta Sodha, Vice-President (Quality), National Independent Schools Alliance, and Vyjayanthi Sankar, Founder & Executive Director, Centre for Science of Student Learning. After discussions and debates through roundtables and consultations and collecting feedback on NEP Wiki (www.nep.ccs.in) and from surveys across India, CCS has put together ideas for new education policy--CCS Recommendations for NEP. They cover all three areas of school, higher and vocational education and are presented in a easy to read ppt format. The school education reforms (CCS Ideas for School Reforms) is also in a larger document and the data, logic and rationale used in the this could be applied to higher and vocational education reform ideas. 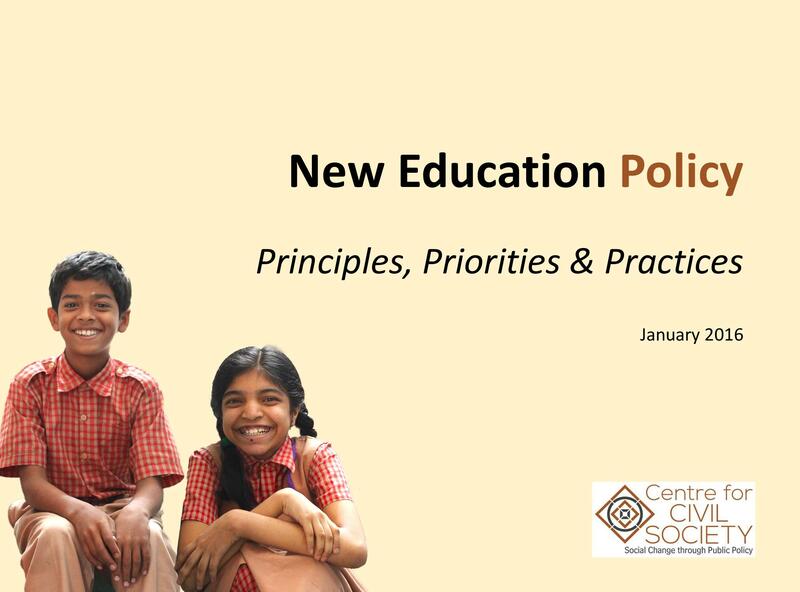 Since the New Education Policy (NEP) was first announced in 2015, CCS has been consistently engaged in research, ideation and advocacy for promoting effective reforms that bring choice, accountability and innovation in education. In December, we were invited to present our education reform ideas to the Kasturirangan Committee, the apex body headed by Dr K. Kasturirangan tasked with developing the New Education Policy. Parth J Shah, President, CCS, presented policy recommendations on the separation of the government's role as regulator, financier and provider of education; the need to fund students not schools, through the implementation of Direct Benefit Transfers (DBT), and learning outcomes-based school recognition. We have been invited by NITI Aayog to make a presentation on our NEP recommendations on 2 November 2016 to be chaired by Shri Arvind Panagariya, Hon'ble Vice Chairman, NITI Aayog. Since the NEP was first announced in 2015, CCS has been consistently engaged in research, ideation and advocacy for promoting effective reforms that bring choice, accountability and innovation in education. Through roundtables, dialogues, expert consultations, nationwide surveys and targeted advocacy, in October we consolidated a comprehensive document of reform ideas that addresses school-level, higher and vocational education in the country. With a view to build momentum for the imminent NEP 2016, we undertook a comprehensive knowledge-sharing exercise. We shared our 12 catalytic reform ideas, along with the CCS NEP Policy Brief, Commentary on the TSR Committee Report, Summary of the MHRD NEP draft and a comparative analysis of the MHRD draft and Committee Report. 78 postal parcels and over 250 emails were sent. Due follow-ups with the addresses are underway. 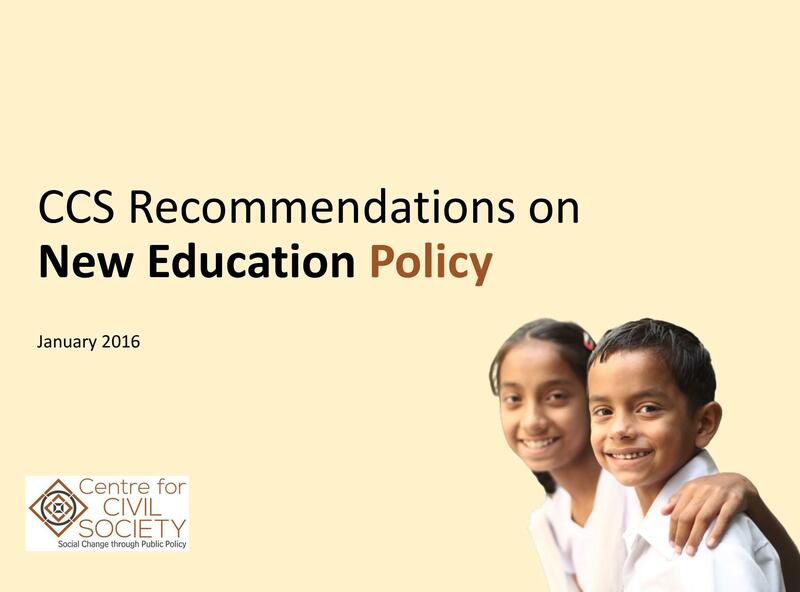 CCS has been working towards building a civil society dialogue on the New Education Policy 2016 since the release of the policy draft by the MHRD in June. To enable a dialogue between policy-makers and state representatives on key considerations for education reform in the country, we hosted a Policy Roundtable for Parliamentarians in Delhi on 2 August 2016. Twelve prominent Members of Parliament representing a spectrum of political parties participated in the discussions lead by panelists Shailaja Chandra, Member of Drafting Committee for framing the New Education Policy, and Parth Shah, Founder and President, Centre for Civil Society. Some of the key ideas that emerged from the discussion facilitating greater investment in education, shift policy focus to learning outcomes and incorporate vocational training in school education. You can access the event report here. We hosted a roundtable for investors in Mumbai, bringing together prominent industry leaders and philanthropists to think together on the NEP. We also brought together 12 prominent parliamentarians for a roundtable in Delhi that further consolidated reform recommendations for facilitating greater investment in education, shifting the policy focus to learning outcomes, and incorporating vocational training in school education. Following the publication of Gurcharan Das's (Author, and Trustee, CCS) letter to the new HRD Minister, Shri. Prakash Javadekar, in the Times of India on July 10, Parth Shah, President, CCS met with Shri. Javadekar along with Gurcharan Das and Ashish Dhawan (Founder and CEO, Central Square Foundation and Trustee, CCS). An exhaustive letter with key policy recommendations asserting the need for participation in standardised student assessments, linking student and teacher profiles with UID and DBTs for the 25% reservation under the RTE was subsequently submitted to the Hon'ble Minister.